^ NPC Quiet Zone Newsletter Spring 2003. Nonoise.org. [2011-04-23]. ^ Cheryl Springfels. 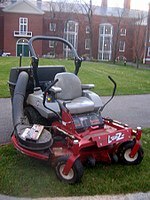 Noise pollution and push lawn mowers, electric mowers, and gas mowers. Peoplepoweredmachines.com. [2011-04-23]. ^ Safe mowing tips help you avoid injury. The Orange County Register. （原始内容存档于2012-09-10）. ^ US RE 8560,Passmore, Everett G.,「Improvement in Lawn-Mowers」,发表于23 February 1869,发行于28 January 1879 ; see pg 1, col 2. For a copy, see Google Patents copy. This source indicates the patent number as "6,080". According to "British patent numbers 1617 – 1852 (old series) 互联网档案馆的存檔，存档日期2011-10-17. ", the patent number would have been assigned sometime after 1852 and taken the form of "6080/1830".